Santa Barbara is a beautiful, small, picturesque, fun city to visit, AND it’s a perfect one-day road trip from L.A! 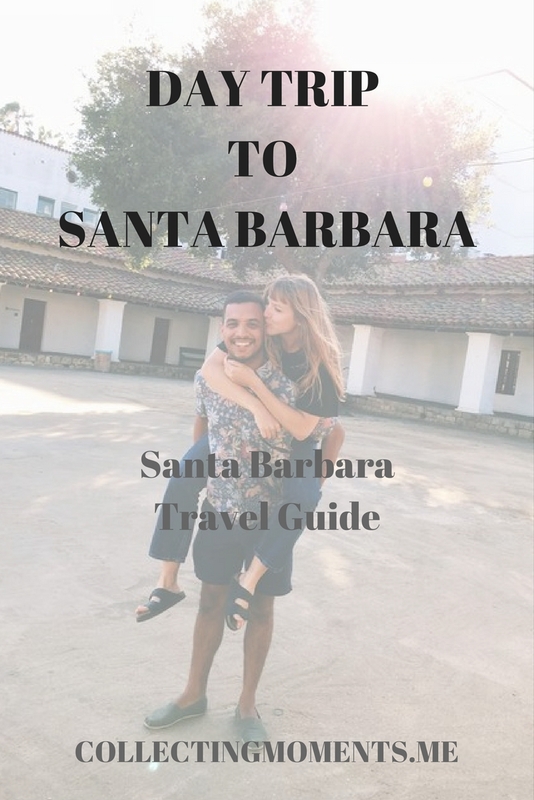 So if you are wanting to change things up on a weekend, or you booked too many days on your L.A. visit, or you simply want to have a mini-vacation but don’t have any vacations days to take, head on over to Santa Barbara for a fun day trip! When my parents visited us this past April, we were looking to get out of the L.A. life but didn’t have enough days to drive up to San Francisco or even down to San Diego, so instead we drove to Santa Barbara and had such a wonderful time! I absolutely recommend taking one day out of your weekend and exploring this neighboring city. You won’t regret it! 1) Drive up the PCH: Make sure to take the scenic route to Santa Barbara! Driving up the Pacific Coast Highway is an amazing part of the whole trip as you have incredible views, you get to see Malibu, and then later you even see some strawberry fields before finishing your two hour drive. 2) Visit Old Mission Santa Barbara: This is the first stop we made once we got to S.B. Old Mission is a well-known historical landmark and a nice cultural experience. Spanish Franciscans founded the mission more than 200 years ago! Admission costs $8/pp and you get to tour the mission’s gardens, cemetery, church and museum. 3) Walk around East Beach: Depending on the weather, hangout at East Beach or walk around; you are on the coast after all! 4) Visit Stearns Wharf: After you are done chilling at the beach, head on over to Stearns Warf. Walk the pier, take some photos, and grab some food. 5) Eat and shop on State Street: Lastly, finish your day walking, shopping, and (if you’re hungry) eating along State Street. This street starts out right on Stearns Wharf and takes you all the way to downtown S.B. There are countless amazing boutiques, restaurants, and bars to choose from. 1) Spend a night in a posada: Guille and I had been to S.B. once before (a very long time ago!) and spent a superb night at a charming little inn, Casa Del Mar. We had a great time; the place was very romantic, and I would like to repeat this experience again on my next visit. 2) Book a sustainable wine tour: I would LOVE to spend a whole day touring Santa Barbara’s boutique wineries! Basically, you get to visit different small-production, family-owned wineries committed to sustainability. They offer shared and private tours, and the tour typically lasts from 10am-5pm. Costs vary depending on preferences. 3) Visit Cold Springs Tavern: This Western bar is highly praised as “Top things to do in Santa Barbara” by TripAdvisor users. It’s located 20mins away from downtown and is described by some as a fun and quirky place to grab some food and drinks. Hope this guide is useful! Please comment if you have been to any of these places or any other suggestions for our next visit!